"If the oil and gas industry puts fracking wells in our neighborhoods, threatening our lives and our children's lives, then don't we have a moral responsibility to blow up wells and eliminate fracking and workers?" wrote Andrew J. O'Connor, who is trying to get an anti-fracking measure on November's ballot. We repeat. This is not pretend. This letter appeared in the Daily Camera. After readers expressed dismay, the newspaper softened the online version of the call to violence. Instead of suggesting bombs, the revised version says we "have a moral responsibility to take action to dissuade frackers" from operating. An editor's note, explaining the revision, said the Camera does not condone violence. The note goes on to defend the letter for presenting "a philosophical question the Camera believes is worthy of community conversation in the context of the ongoing discussion over fracking." In an interview with Dan Njegomir, of ColoradoPolitics.com, O'Connor escalated his defense of violence toward workers. "I wouldn't have a problem with a sniper shooting one of the workers" at a drilling site, O'Connor said, arguing he was not specifically calling anyone to carry out any such act. "I see fracking as murder, and there's medical and scientific evidence of that." Actually, there is not. A recent study by the Colorado Department of Health and Environment analyzed 10,000 air samples taken from the immediate vicinity of fracking wells and found concentrations of toxins lower than limits set by the EPA. Contamination of water has been negligible and rare, as have lethal drilling site accidents. As we previously posted about here on The Daily Digger, the Rover pipeline has had a couple of spills during the construction process. These occurrences are drawing attention to the project - no doubt the kind of attention that Energy Transfer Partners would rather avoid. So Earth did it, in cahoots with the environment. No one should be surprised that construction of the pipeline, which started only recently, has led to screw-ups. Rover has not hidden the fact that it is in a hurry. Corporate attorneys argued this year in U.S. District Court that Rover had to make haste. The company needed permission to cut trees along the pipeline’s path ASAP because endangered bats would soon awaken from their winter slumber and begin roosting in trees. Rover had to finish its tree-cutting before April 1, or the project would be forced to endure a costly delay until the bats left the trees and returned to hibernation in the fall. Hemorrhaging a few million gallons of muck into some wetlands is one thing. Hemorrhaging money is quite another. Officials are showing concern following two Rover Pipeline spills last week, one in a wetland near the Tuscarawas River in Navarre. Tuscarawas County Commissioner Joe Scarretti, noted anything that happens upstream of the river, should be of concern to the county. Scarretti went on to say that unfortunately with major projects like this one, mistakes are likely to be made. Rover tore down the Stoneman House before notifying the Federal Energy Regulatory Commission, even though the commission had identified the building as a concern. On Feb. 23, 2015, Rover reportedly filed its application for the project, which included a commitment to “a solution that results in no adverse effects” to the historic structure. But the house was torn down in May 2016. After learning that the house had been torn down, preservation office staff said Rover should provide financial assistance to the state preservation office for local preservation needs. The company agreed to pay $2.3 million to a fund administered by the Ohio History Connection Foundation and the State Historic Preservation Office. 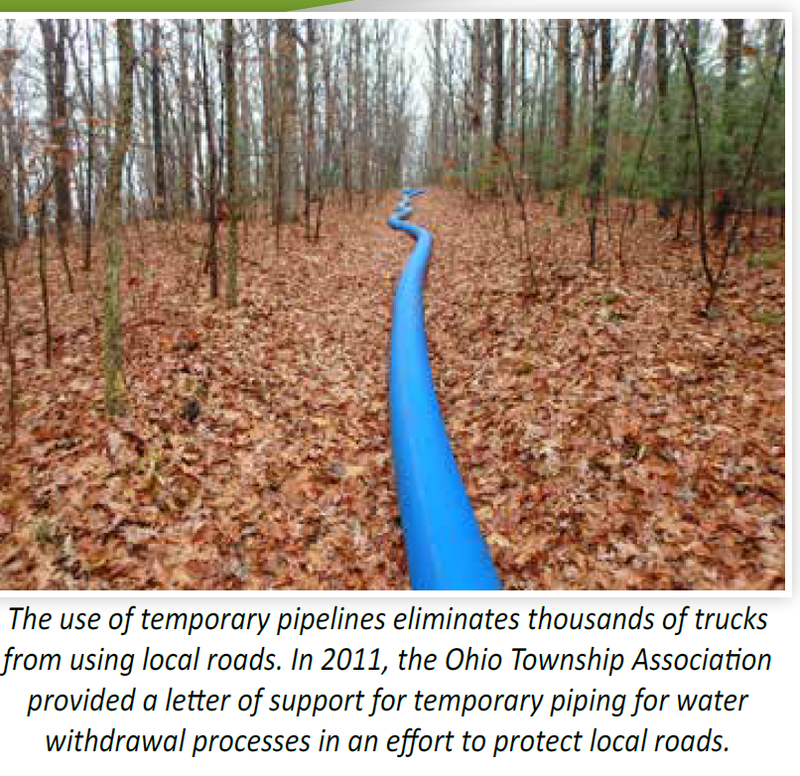 A total of $1 million is for preservation work in the 18 counties crossed by the pipeline. The rest of the money will be used for projects across the state. One would imagine that the Rover pipeline would prefer to simply stay out of the news as construction continues. Overemphasizing the shift in the energy markets since 2005 is hard. Had you predicted the shift that was to come, you would have been widely deemed a lunatic. But let me take you back there for a moment and remind you of where we stood, and what played out over the next decade. U.S. oil production had seemingly peaked in 1970 at 9.6 million barrels per day (BPD), and by 2005 had declined for 35 years. Production in 2005 stood at 5.2 million BPD, and crude oil imports had reached 10.1 million BPD -- just under 50% of total U.S. petroleum consumption. The U.S. economy was in a precarious situation, highly dependent on oil imports from countries like Venezuela and Saudi Arabia; countries whose interests weren’t always aligned with our own. Concerns about oil supplies weren’t limited to the U.S. In 2005 energy investment banker Matt Simmons published Twilight in the Desert: The Coming Saudi Oil Shock and the World Economy. Simmons helped set off a fierce debate about whether Saudi Arabia -- and the world as a whole -- had reached a global peak in oil production. This thesis gained traction over the next three years, as oil prices surged past $100/bbl and helped push the world into recession. The U.S. desperately needed a miracle to reverse decades of growing energy dependence. Actually one was in the works, unbeknownst to most Americans. In a matter of weeks, crews working for Exxon’s XTO Energy Inc. unit will begin erecting drilling rigs across a patch of southeast New Mexico to exploit the region’s mile-thick strata of oil-soaked rock. ExxonMobil Corp. paid almost $6 billion for the drilling rights in late February—its biggest acquisition in more than six years—but that’s where the parent company’s involvement ends: Decisions on when and how to harvest the crude fall solely on the shale experts at XTO. Exxon Chief Executive Officer Darren Woods and his top lieutenants at corporate headquarters in suburban Dallas are intentionally staying out of the way of the tightly knit phalanx of XTO engineers, physicists, and geologists leading the oil major’s advance into shale. Based largely in the Texas cities of Fort Worth and Midland, XTO’s 5,000-person staff has been exempt from many of the centralized bureaucratic and planning structures of their overlords since Exxon acquired XTO for $35 billion in 2010, according to people with knowledge of the arrangements who weren’t authorized to speak publicly. The most striking aspect of the energy sector in recent weeks has been an all-round lack of confidence. Relative to the wider market, the E&P sector's performance this month looks even worse given that the S&P 500 is essentially flat. Clearly, crude oil hovering around $50 a barrel doesn't represent a return to the good old days. Equally, though, it isn't at the disastrous levels of a year ago. The futures "strip" -- the average price for the next 12 months -- has recovered from the sell-off in March and trades around the same level it jumped to in the aftermath of the OPEC supply-cut announcement at the end of November. Moreover, many E&P companies have already taken the opportunity to lock in prices at around that level via hedges, according to data from Bloomberg Intelligence, providing some protection against any weaker prices ahead. Meanwhile, rig counts, payrolls and services providers such as Halliburton Co. are sending strong signals of a rebound in U.S. onshore drilling. When earnings season for E&P firms kicks off next week, the messaging, at least, will be pretty bullish in terms of growth plans (and that is what tends to count in this sector). Questions about cost inflation, the shadow hanging over the industry for the past year, will likely be less urgent than on prior calls, given that oilfield-services stocks are down almost as much as their E&P counterparts. So why so glum? Net production during the first quarter of 2017 averaged 849.6 MMcfe per day, an 8% increase over the fourth quarter of 2016 and a 23% increase versus the first quarter of 2016. Realized natural gas price, before the impact of derivatives and including transportation costs, averaged $2.68 per Mcf during the first quarter of 2017, a $0.63 per Mcf differential to the average trade month NYMEX settled price. Realized oil price, before the impact of derivatives and including transportation costs, averaged $47.52 per barrel during the first quarter of 2017, a $4.34 per barrel differential to the average WTI oil price. Realized natural gas liquids price, before the impact of derivatives and including transportation costs, averaged $0.63 per gallon, equivalent to $26.46 per barrel, during the first quarter of 2017, or approximately 51% of the average WTI oil price. Boosted by the Lordstown Energy Center project, private companies invested more than $1 billion last year in the Mahoning Valley, according to data released Monday by the Youngstown Warren Regional Chamber. Perhaps one of the best examples of how fracking is a win for the environment and the economy can be found in Ohio, where fracking has brought more than $200 million in mineral lease and royalty revenue to the Muskingum Watershed Conservancy District (MWCD) since 2011. A direct result of leases signed with Utica Shale developers in the eastern portion of the district, the revenue has been used to improve the watershed of this political subdivision of the State of Ohio, proving that conservation and shale development can work hand-in-hand. Created in 1933, MWCD is tasked to reduce flooding and conserve water for beneficial uses in the Muskingum Watershed, which covers nearly 20 percent of the state. Today, the MWCD covers 8,000 square miles with 16 dams and reservoirs that provide flood reduction, recreation and water conservation for the region. Given its location in the state, partnering with the oil and gas industry is nothing new for the MWCD. As you can see in the chart above, the MWCD received royalty payments before additional Utica Shale leasing took place in 2011. Since its inception, the MWCD has entered into leases and allowed conventional oil and gas development on its lands for the past 81 years. Today, the MWCD has an estimated 120 producing wells on MWCD-owned property and is receiving royalties from 29 Utica Shale wells. The proceeds from leasing and royalty payments become a critical way for the MWCD to fund its operations and make improvements to the watershed. In fact, the influx of capital enabled the Capital Improvement Plan that was initiated in 2015 and is slated for completion in 2022. The Capital Improvement Plan includes major improvements to public parks, campgrounds and marinas among other things. Of course, with such a focus on conservation, the MWCD and producers have worked together to provide the most conservation-friendly leases to ensure that the beauty of the MWCD will not be disrupted. Their leases include non-development provisions that prevent any rigs, lease roads, pipelines or compressor stations to be placed on MWCD-owned land. 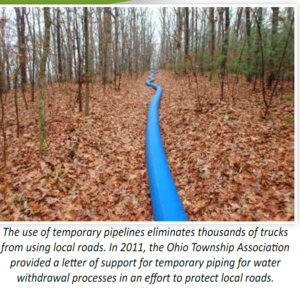 Again, with a focus on conservation, the MWCD sold much of the water used for development via temporary water lines to well sites. These temporary lines were responsible for removing 18,000 water truck trips in Harrison County alone. These temporary water sales are a great idea to help increase revenue for the MWCD, too, considering there is plenty of water to go around for everyone in the area. For example, the Seneca Lake summertime pool holds over 14 billion gallons of water. However, in the event of a serious drought condition, the MWCD does have the authority to shut down any water sales to protect its customers and residents. Ironically, and not surprisingly, when negotiations for leasing and water contracts were underway, anti-fracking groups such as the Fresh Water Accountability Project were engaged in fearmongering with baseless claims that fracking would cause groundwater contamination and inhibit the very purpose of the MWCD. 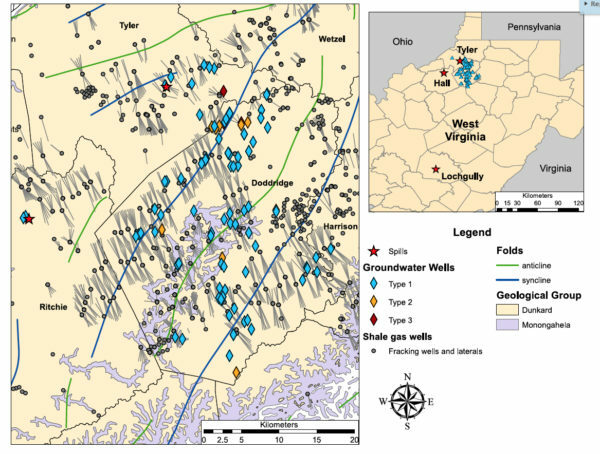 Of course, that hasn’t happened, and in fact the most extensive groundwater study in Ohio by the University of Cincinnati found that there has been “no evidence for natural gas contamination from shale oil and gas mining in any of the sampled groundwater wells of our study.” The simple fact is that for the past six years there have been 29 Utica Shale wells developed (by fracking) which have contributed greatly to the $200 million poured into the MWCD. 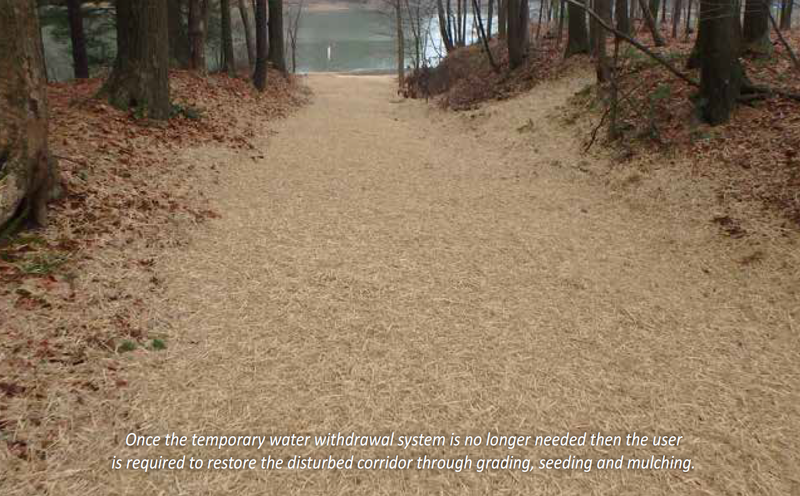 This has allowed for vast capital improvements and at the end of the day has supported the core function of the MWCD — to reduce flooding and conserve water for beneficial uses in the Muskingum Watershed. 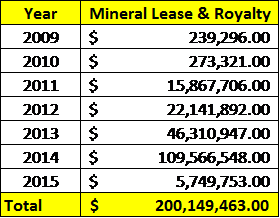 This is just the latest example of how mineral leasing on Ohio state lands has provided huge benefits for areas that have leased. MWCD proves that leasing state lands for oil and gas development has been a win-win. It’s a win for taxpayers, for the state, and for the vast recreational uses that the lands provide. Thanks to the $200 million fracking has generated for the MWCD to support major improvements to public parks, campgrounds and marinas, the outlook for summertime fun at the MWCD looks brighter than ever. The nodding donkey was invented nearly a century ago, and it’s still hard at work in the oil patch, virtually unchanged, pumping oil out of the ground. There’s been a recent innovation, though: Algorithms adjust the extraction flow based on computer monitoring hundreds of feet below. The worst crude-market crash in a generation propelled energy companies into the digital world. They had already pretty much tested their physical limits with brute strength, ramping up injections of sand to tease more oil out of subterranean pockets and drilling wells longer and longer. Now they’re using DNA sequencing to track crude molecules and mapping buried streams with imaging software. Robots are fitting pipes together. Roughnecks consult mobile apps for drilling-direction advice. Oilfield services providers find themselves in a new arms race, led by giant Schlumberger Ltd., which recently opened an office on Sand Hill Road in the heart of Silicon Valley. A team led by McKenzie, an assistant research professor at the University of Colorado, released a new study earlier this year that attempted to link oil and natural gas development to childhood leukemia. The study immediately became a talking point for “ban fracking” activists, even though it was quickly discredited by state health officials. 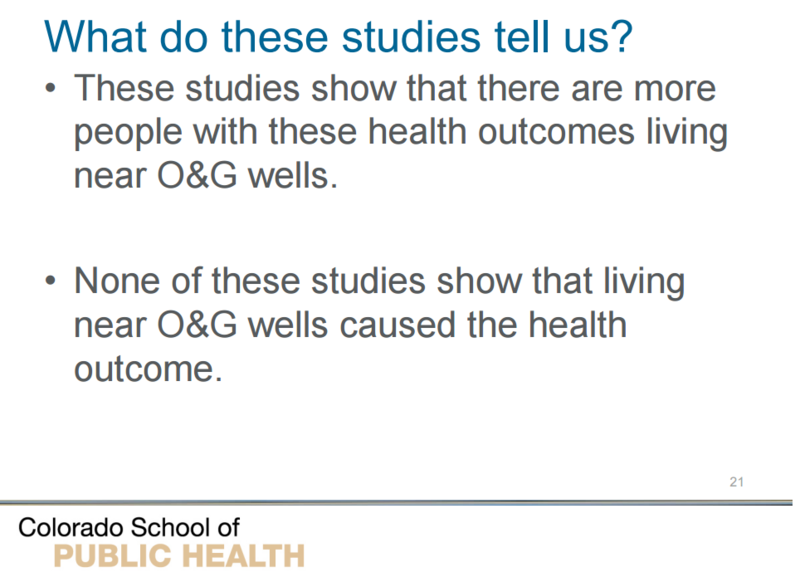 Source: McKenzie’s April 13 presentation on the health implications of oil and gas development. Quick reproof from state health officials followed by sheepish concessions from the researchers appears to be the chain of events we can expect of studies produced by McKenzie’s team. 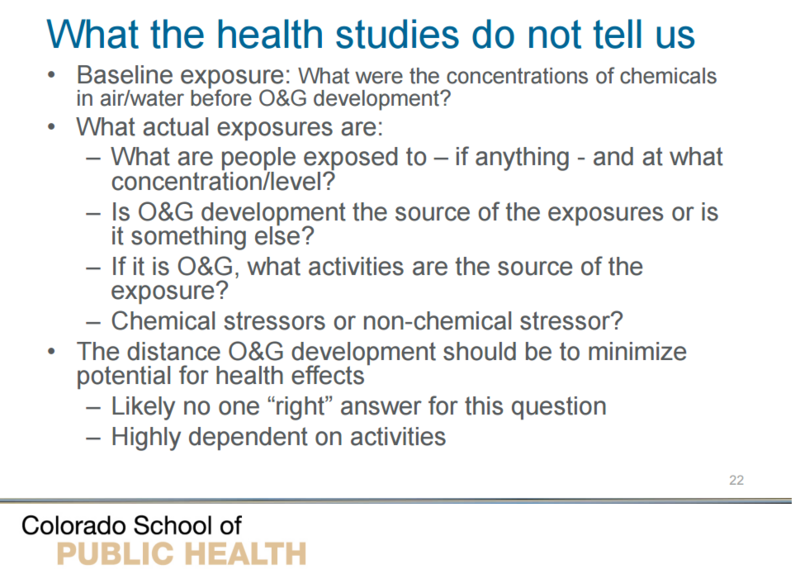 Her team’s 2014 paper that attempted to link oil and natural gas development to birth defects was promptly disavowed by the Colorado Department of Public Health and Environment, and its 2012 paper that attempted to connect proximity to natural gas wells to increased cancer risks forced concessions and qualifications from McKenzie on the findings. The “ban fracking” speaking circuit may be all that McKenzie can resort to these days. After all, she was originally scheduled to speak at a Broomfield town hall meeting in February but was removed from the agenda after her latest study was discredited by state officials. Crews installing the Rover pipeline dumped an estimated 2 million gallons of drilling mud into two Ohio wetlands, according to a notice of violations filed with the Ohio Environmental Protection Agency. Once constructed, the $4.2 billion underground pipeline will run from Washington County in southeast Ohio northwest to Defiance and connect with pipelines to send Ohio natural gas to markets nationwide. The larger spill coated 500,000 square feet of a wetland adjacent to the Tuscarawas River in Northeast Ohio with as much as 2 million gallons of bentonite clay mud, which is used as a drilling lubricant. The drilling fluid is not toxic and won’t harmf the environment, Alexis Daniel, a spokeswoman for the Rover Pipeline, said in an email statement. The company has ceased operations at its Navarre-area site and constructed barriers to keep the mud from reaching the river while vacuum trucks and pumping systems continue cleanup efforts. U.S. shale production in May was set for its biggest monthly increase in more than two years, government data showed on Monday, as producers stepped up their drilling activity with oil prices hovering at over $50 a barrel. May output is set to rise by 123,000 barrels per day to 5.19 million bpd, according to the U.S. Energy Information Administration's drilling productivity report. That would be the biggest monthly increase since February 2015 and the highest monthly production level since November 2015. In the prolific Permian play located in West Texas and New Mexico, oil production is forecast to rise by nearly 76,000 bpd to 2.36 million bpd, data showed, a new record for the largest U.S. shale play. In the Eagle Ford region, output is set to rise by 39,000 bpd to 1.22 million bpd, the third monthly increase. Production in the Bakken is forecast to drop 1,400 bpd to 1.02 million bpd, the third consecutive monthly decline. Oil prices hit their lowest in 11 days on Tuesday on news that U.S. shale oil output in May is expected to post the biggest monthly increase in more than two years, fueling concerns that U.S. production growth is undermining efforts to cut oversupply. U.S. government drilling data showed shale production next month was set to rise to 5.19 million barrels per day (bpd), with output from the Permian play, the largest U.S. shale region, expected to reach a record 2.36 million bpd. Global benchmark Brent crude futures were down 49 cents at $54.87 a barrel at 1038 GMT. They touched $54.76 intraday, the lowest since April 7. U.S. West Texas Intermediate crude futures traded down 46 cents at $52.19 a barrel. Their intraday low was $52.16, also the weakest since April 7. There are three good guesses for which U.S. county has the the highest adjusted gross incomes (AGI): New York County, otherwise known as Manhattan; Connecticut’s Fairfield County, where those rich Manhattanites land when they want a lawn; and Wyoming’s Teton County, home of Jackson Hole, where the richest of the rich go to play and sometimes stay. On the county level at least, income from shale oil in South Texas overshadowed East Coast stock market wealth, the numbers reveal. “I joke that oil and gas finally made ranching profitable,” said Thomas Tunstall, research director for the Institute for Economic Development at the University of Texas at San Antonio. “A lot of old Texas families live on large ranches in McMullen County, and the older generation went through tough times prior to five years ago.” Now, he said with mock horror, he’s hearing about Bentleys, rather than F-150s, driving down those gravel roads. An oil and gas drilling company has dropped four counterclaims it has made against the city of Munroe Falls, but legal wrangling in the case concerning a well on the Sonoco paper mill property is not over. According to Summit County Court of Common Pleas records, Ravenna based Beck Energy dismissed its counterclaims, in which the company contended the city had violated its rights and was asking for unspecified damages, against the city on Feb. 1 in a declaratory judgment case filed by the city in May 2016. However, on Feb. 3, Beck Energy then filed a motion asking the court for sanctions against the city. The company is claiming that the court case is “frivolous” because it involves a question already dealt with by an earlier Ohio Supreme Court case. Beck is therefore asking the court to order the city to compensate it for “court costs, attorney fees, and other reasonable expenses” Beck is spending on the case. “They’re saying basically we’re re-litigating old business,” Munroe Falls Law Director Tom Kostoff told City Council Feb. 7. Two weeks after a judge reversed a $4.24 million well contamination verdict against Cabot Oil & Gas Corp., another Dimock Twp. resident filed a federal lawsuit alleging the company’s Marcellus Shale drilling operations contaminated his well water. Ray Kemble claims Cabot’s negligence in drilling natural gas well pads contaminated the well water at his home on Route 3023 with toxic chemicals and high levels of methane. Kevin Cunningham, a spokesman for Cabot, said Kemble’s lawsuit appears to include claims that were resolved by a settlement he reached with Cabot years ago. After the Columbus Dispatch exposed how teachers at Little Dreamers, Big Believers daycare forced preschool children to submit public comment to protest fracking around the Wayne National forest, criticism from the community has come pouring in. As EID has pointed out time and time again, the Wayne National Forest is not contiguous; it’s a patchwork of acreages that includes private lands and minerals throughout, which makes gaining access to federal minerals for subsurface development critical. Without access to these federal minerals adjacent private minerals are not able to be developed fully. In short, Ohio schools have much to gain from fracking and especially in areas surrounding the Wayne National Forest. Sadly, it appears that these preschool and kindergarten children are being fed misinformation despite the fact the Bureau of Land Management found that the forest would in fact incur “no significant impact” from federal mineral development. As Ohio Representative Thompson rightly said, teachers should be educating our children, using facts, not misguided and personal political ideologies. In 2015, the U.S. shale industry was one of the main casualties of the oil price downturn, suffering a 75 percent drop in year-on-year merger and acquisition spending to $13 billion. This amount was the lowest annual M&A U.S. shale spend since 2009. A reshuffling of asset portfolios in 2016 redirected investments away from the Permian basin, and toward the Marcellus Shale which, which led to resurgence in deals as well as natural gas output. The M&A spend in the shale industry bounced back to $48 billion during 2016, representing a 269 percent increase year on year.